Considering the amount of money you spend for an espresso on Starbucks and Dunkin Donuts, getting yourself a decent coffeemaker at home is not a far-fetched option. For starters, there's a lot of cheap brands that offer you solid performance despite the not so steep price tag. 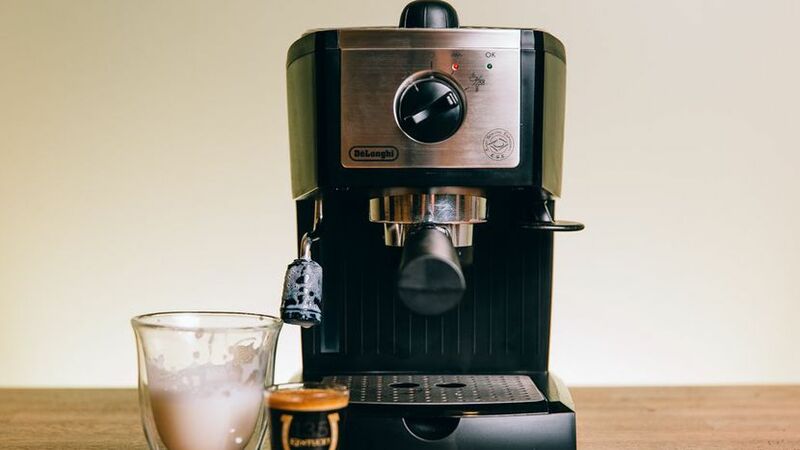 If you don't know where to start, you can check out the ultra-popular DeLonghi EC155 BAR Pump Espresso and Cappuccino Maker. We have recently reviewed two DeLonghi espresso makers some time ago and both the ESAM3300 and the EMK6 did perform well despite our doubts. In the same way, the EC155 BAR Pump Espresso and Cappuccino maker is expected to deliver the same results, if not, better than the above mentioned products. But of course, we will be fair with our review, and we've found out some issues that would affect its day to day performance. In all honesty, there's is so much potential for the EC155, but is it really worth the money despite its glaring flaws? The DeLonghi EC155 is a medium sized pod style coffee maker similar to Bestek's Steam Espresso Machine. Standing at 10.5 x 7 x 8.25 inches, it does not occupy that much space on an average kitchen countertop. It's fairly light too considering it only weighs a mere 6.7 pounds. Its removable reservoir can hold up to a liter of water and it's reasonably easy to pull out thanks to its symmetrical shape. As expected from a standard espresso machine, the EC155 has a portafilter to load and brew pre-selected coffee grounds. The EC155's portafilter locks in tightly within the group-head mounter at the center of the machine. DeLonghi smartly included two portafilters on the package to choose between single shot and double shot servings. The single shot filter can accommodate 0.2 ounces of coffee grounds while the double shot tops out at 0.4 ounces. DeLonghi has long been known for their easy to use products and the EC155 is no exception. The selector knob located at the front of the espresso maker lets users choose between four modes. At the twist of the dial, the user will be able to choose from resting, heating, espresso brewing and steaming modes. To the right of the machine is a temperature indicating diode that is red when its still heating up and green if the water is hot enough for brewing or creating steam. There is also a steam controller on the EC155's top side. The knob increases or decreases the flow of steam on the machine's wand appendage. The patented dual filter holder also allows it to fit E.S.E pods. Inside, the EC155 BAR Pump Espresso and Cappuccino maker is a small vibratory pump that does its job on medium grinds but suffers badly against very fine coffee grounds. That being the case, the EC155 chokes under pressure compared to bigger and more reliable espresso makers that have standard rotary pumps. The machine's under-powered pump lacks the ability to push water through finely ground coffee beans. But considering its price, DeLonghi's entry-level espresso maker is capable of filling out somebody's morning caffeine fix, albeit its mediocre tasting coffee. Above all, if you're happy with traditional dark roasts combined with steamed milk, the EC155 might as well be worth the gamble. Aside from the cheap price, the EC155's patented dual function filter holder makes it easier for users to switch between coffee grounds and E.S.E. pods. Ease of use is also one of the machine's strongest traits, the selector knob is easy to operate and the added swivel jet frother creates a rich and creamy froth perfect for a cup of cappuccino. It is also worth mentioning that the EC155 is easy to clean. The 35-ounce water tank and the drip tray are removable. They are both easy to dismantle, wash, and reassemble when there is a need to brew your favorite cup of joe. If you are expecting the EC155 to produce high-quality espresso, you might be a bit disappointed. Its lackluster pump can't even push hot water through ultra-fine grounds, and in some instances can choke on an actual operation. As a matter of fact, reports of erratic water temperature control is common among its users, although we didn't run into trouble while doing our own brewing test. Another glaring flaw is its inability to extract subtle flavors locked within medium and lightly roasted coffee beans. Its inconsistency is quite highlighted in many user reviews. Nonetheless, its flaws are as much as you'd expect for an espresso maker that is as cheap as the EC155. If you are on the hunt for the best and cheapest espresso maker available in the market today, you'll be frustrated to discover that the EC155 is trumped by a cheaper and more reliable espresso maker in Bestek's 3.5 Bar Steam Espresso and Cappuccino Maker. If you do have extra money to spare, we recommend that you choose a more expensive but reliable machine. If you are not sure, you can check out our buying guide and choose which suite best for your needs. Depending on your budget, banking on the reliability of cheaper espresso makers can be disappointing. In fact, this might be the case for the DeLonghi EC155 Pump Espresso and Cappuccino Maker. Equipped with a pump that fails to perform on fine coffee grounds is a bit disturbing, not to mention the machine's other inconsistencies. The buttons and its fancy looking design might let you think that its a steal, but at its best, the EC155 is just another mediocre performing machine when it's not exhibiting its known problems. If you want to buy one, the risk is all yours.